Akita (pop. 312,000), capital of the prefecture of the same name, is the second largest city of the Tōhoku region after Sendai. 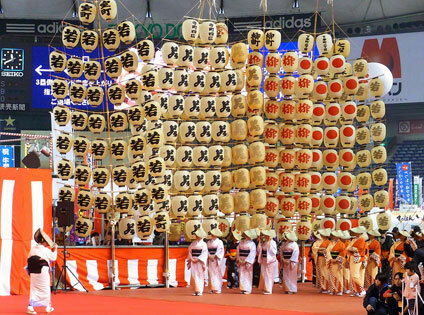 It is a bustling port and industrial city without much tourist interest, except for its annual Kantō Matsuri (竿燈祭り), one of Japan's most famous festivals. Its main rivals in Tōhoku are Aomori's Nebuta Matsuri, Hirosaki's Neputa Matsuri, and Sendai's Tanabata Matsuri and Aoba Matsuri. The festival is held from 3 to 6 August each year. Hundreds of participants balance some 10 to 15 metre tall poles with plenty of lanterns hanging in rows through the streets. The effect is particularly impressive at night when the lanterns are illuminated. If you happen to be in Akita at another time of the year, you can console yourself by visiting the Kantō Festival Centre (ねぶり流し館 "Neburi Nagashi Kan"), where you can see videos of the festival. The centre is located about 1 km west of the JR station, just across the river. Akita is easily accessible by train as it is on the Shinkansen Komachi line. The journey from Tokyo (￥9,560) takes 4 hours without any change of train required. Coming from Aomori, the JR Limite Express Inaho takes 2 hours 40 minutes (￥3,260). By air, Akita airport is 50 minutes by bus from the city (￥890). There are flights to and from Sapporo (Chitose), Tokyo (Haneda), Nagoya and Osaka (Itami and Kansai).